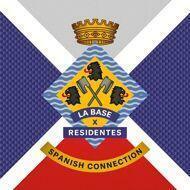 The Residentes hailing from Tenerife Spain teamed up with Switzerland's finest La Base to put out an EP filled with 3 extra rugged Songs produced by the Tru Comers and MPadrums. On top of that the legendary UK Producer George Fields didn't hesitate to provide a remix to one of these Songs to complete this EP. What more can be said, you better cop this one before it's gone!